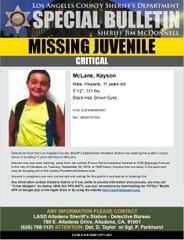 Los Angeles County Sheriff’s Department’s Missing Persons Unit detectives are seeking the public’s assistance in locating Kayson McLane. He is an 11 year-old male Hispanic who was last seen walking away from his school (Focus Point Academy) in Altadena, on Tuesday, September 25, 2018 at 10:45 p.m.
Mr. McLane is described as 5’1/2”, 131 lbs., black hair, and brown eyes. Kayson has run away in the past and may be hanging out in the nearby area. His caregivers are very concerned and asking for the public’s assistance in located him.